June 25th is a day of celebration of our lives and our community. The first World Vitiligo Day was held in 2011 and has since become an annual, global event. Over the years, its purpose has broadened from raising awareness of vitiligo to include recognition of the bullying, social neglect, psychological trauma and disability of millions of people affected by vitiligo. 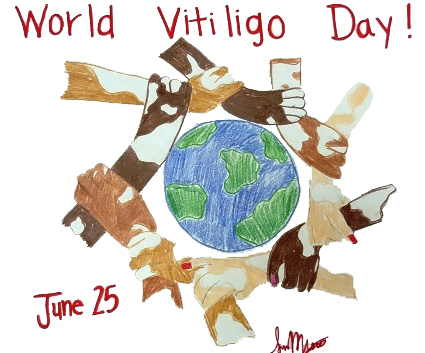 We want June 25th to be recognized by the United Nations as World Vitiligo Day. You can help us by signing our petition to the UN Secretary-General - read it below and make sure you go to www.25June.org and add your name to the 500,000+ who have already signed. Media ToolkitMany of you ask general questions about the World Vitiligo Day campaign and how to get involved. In 2018, the 7th celebration of World Vitiligo Day will be will be held at UMass Medical School in Worcester, MA on June 22nd-24th, 2018, and hosted by Dr. John Harris, the Director of the Vitiligo Clinic and Research Center at UMass Medical School, and VITFriends under the leadership of Valarie Molyneaux. The title for the event is “Children, Research, and Hope for the Future”, and will feature a session focused on children with vitiligo together with another session with vitiligo experts talking about their own research to improve the lives of patients with vitiligo. There will be plenty of time for all to socialize and get to know each other. The WVD Organizing Committee will soon decide about campaign's international headquarters. 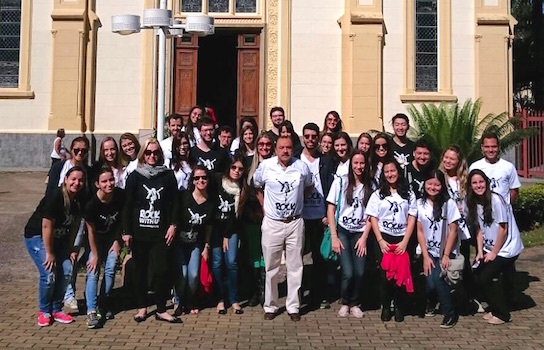 The campaign headquarters were set up in Sao Paulo, Brazil, under the presidency of Professor Paulo Cunha. He is well known for his unerring support for the vitiligo cause and he does incredible work with underprivileged communities, including with many Amazonian tribes - who have no access to medical care or dermatological services. Prof. Cunha is truly committed to bringing the best tools and techniques in the treatment of vitiligo and to fellow dermatologists and patients, organizing national master classes on vitiligo in 2013 and 2016, and holding World Vitiligo Day events since it's inception. In the US, main celebrations were held in Detroit on June 23-25, under the leadership of Lee Thomas, hosted by Southeast Michigan Vitiligo Support Group, check photos on Facebook. This year's rally and other events were one of the largest and most exciting in history of the World Vitiligo Day. Prof. Jana Hercogova, the Chair of WVD 2016 campaign, held a key media event in beautiful Prague. World Vitiligo Day 2015 campaign headquarters are in Shenyang, China, under the presidency of Prof. Xing-Hua Gao, MD. 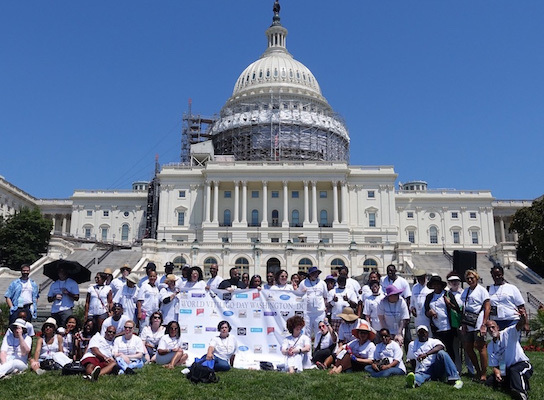 Thousands of vehement volunteers around the world raise awareness for vitiligo on the streets and in the media, in addition to 30+ major hospitals receiving vitiligo patients and holding education events today. This year all events started much earlier, on 13 Feb 2015, when the General Body Meeting of Indian Association of Dermatologists, Venereologists and Leprologists (IADVL), the largest representing society of Indian Dermatologists, has approved the changing of IADVL VITILIGO Day from May 19th to 25th June. In the last three years, campaign grew from a few volunteers handing out fliers in the streets and a small number of dedicated doctors to 484,687 activists and 50+ clinics offering free skin check-ups in 17 countries. We have already set up two new 'world records' with 225 vitiligo patients seen by dermatologists in the morning at the PIGMER hospital, and 800+ doctors attending events in the afternoon. 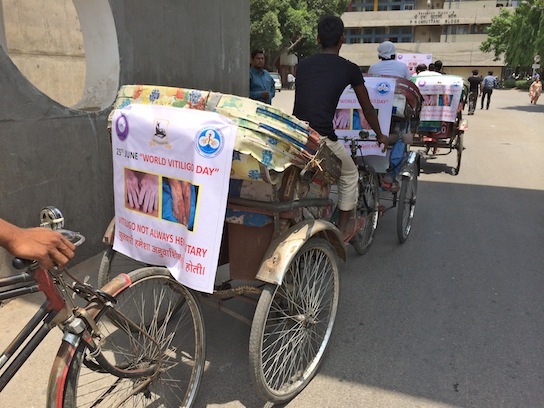 Forty WVD-branded rickshaws paraded the city of Chandigarh, host of World Vitiligo Day 2014, all day long. This year, the World Vitiligo Day changed it's headquarters from Rome (Italy) to Detroit (USA) and was celebrated in a series of events, from the distribution of leaflets to large gatherings, which have made each World Vitiligo Day a huge success and generated worldwide media interest: Fox TV interview with entertainment guru Lee Thomas, roundtable with Henry Ford Hospital Dermatology Chair Dr. Henry Lim, art-project with Stephanie Corne and so on. We collected 130,929 signatures to date. 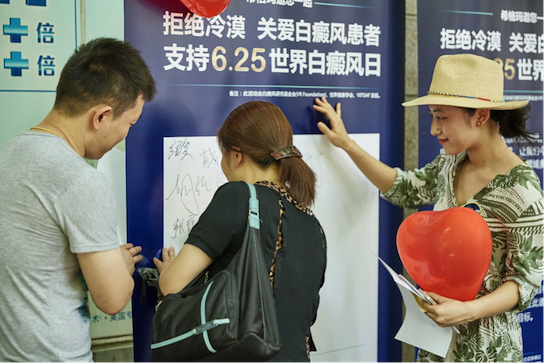 An ambitious global event, the second World Vitiligo Day was held on the week of 25 June this year. It also marks the passing date of pop-star Michael Jackson, a long-time vitiligo sufferer. The event started with the press conference in Rome on June 22nd, continued with free dermatology consultations across Italy over the weekend, rolled into street events in Brazil and Nigeria, appeared on media radars and screens in Botswana, Chad, China, Czech, France, India, Macedonia, the UK and USA on June 25th, and finished at the national dermatology congress in Russia on June 26th. The first Vitiligo Awareness Day or Purple Fun Day - what it was called then - was brought to life by Ogo Maduewesi, Founder and President of Vitiligo Support and Awareness Foundation (VITSAF) at Silverbird Galleria, Victoria Island in Lagos, Nigeria. The online petition was launched on the website Petitions24 on June 18, 2011. First 111 signatures were collected on the first World Vitiligo Day. Early next year, VR Foundation helped to re-name the campaign, developed marketing materials and launched www.25June.org, which became the official site of the World Vitiligo Day campaign, on January 18, 2012.